Tuesday, January 29, 2019 4:00-8:00 p.m.
Wednesday, January 30, 2019 9:30-10:30 a.m.
Mary Ann Peek, nee Hustedde, age 88, of Breese, died Friday, January 25, 2019 at HSHS St. Elizabeth’s Hospital in O’Fallon. She was born January 4, 1931 in Breese, a daughter of the late Frank and Laura, nee Usselmann, Hustedde. She married Henry “Hank” Peek on September 27, 1949 at St. Dominic Catholic Church in Breese and he died October 1, 2013. In addition to her parents and husband, she was preceded in death by brothers, Robert, Joseph, and Francis Hustedde; father-in-law and mother-in-law, John and Theresia, nee Kampwerth, Peek; and brothers-in-law and sisters-in-law, Charles Boeckmann, Joseph and Martha Peek, August and Leona Peek, Sr. Teresta Peek, SSND, Cyril and Estelle Peek, Gerhard and Arlene Peek and John “Jack” Peek. Surviving are her children, Duane Peek of Plano, TX, Donna (Rodell) Weh of Breese, Cindy Dumstorff of High Ridge, MO, and Lisa (Michael) Enright of Harvest, AL; 6 grandchildren, Holly (Kris) Hanson, Dan (Hanni) Peek, Kristie Weh, Derek (Melissa) Weh, Lindsay (Craig) Hejnal, and Hannah Enright; 10 great-grandchildren; Georgia, Kristopher, Kinsley, Camden, Emma, Paxton, Ella, Keaton, Greyson, and Evie; siblings, Monica Boeckmann of Germantown, Rita (Maurice) Albers of Germantown, Rose (Francis) Rehkemper of Breese, Herb (Carol) Hustedde of Breese, Anthony Hustedde of Breese, and Dorothy (Gerald) Showalter of O'Fallon; sister-in-law, Carol Peek of Breese; and numerous nieces and nephews. Mary Ann worked many years at Krebs Studio in Breese and later retired from Dillard’s in Fairview Heights. 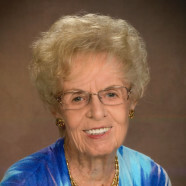 She was a member of St. Dominic Catholic Church in Breese and the Breese American Legion Post 252 Auxiliary. Funeral Mass of Christian Burial will be Wednesday, January 30, 2019 at 11:00 a.m. at St. Dominic Catholic Church in Breese with Fr. Patrick Peter and Deacon Linus Klostermann presiding. Interment will follow in St. Dominic~St. Augustine Cemetery, Breese. Visitation will be Tuesday, January 29, 2019 from 4:00-8:00 p.m. and again on Wednesday, January 30, 2019 from 9:30-10:30 a.m. at Moss Funeral Home in Breese. Memorials may be made to St. Dominic Catholic Church or to Hannah’s Playground and will be received at the funeral home. The Breese American Legion Post 252 Auxiliary will hold services at 7:00 p.m. Tuesday evening at the funeral home.